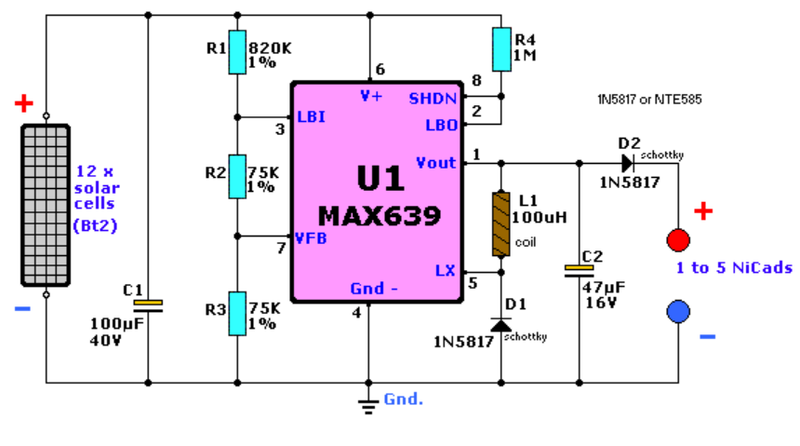 Here are a simple electronic circuit diagram Project of Solar Cell NiCad Charger, this circuit is a very easy build. The MAX639 has its own current limiter build in, set for 200mA. Plenty! Make sure that the charging NiCads can handle the continuous current of 200mA, for example, NiCad battery packs of 1700+ mA used for R/C (Radio Control) cars and electric aircraft. The schematic is copyright © by Maxim and used with permission. However, the diagram as shown on the Maxim website, has a problem. It shows incorrect values for D1/D2 diodes (1N5117). I updated this value to 1N5817.